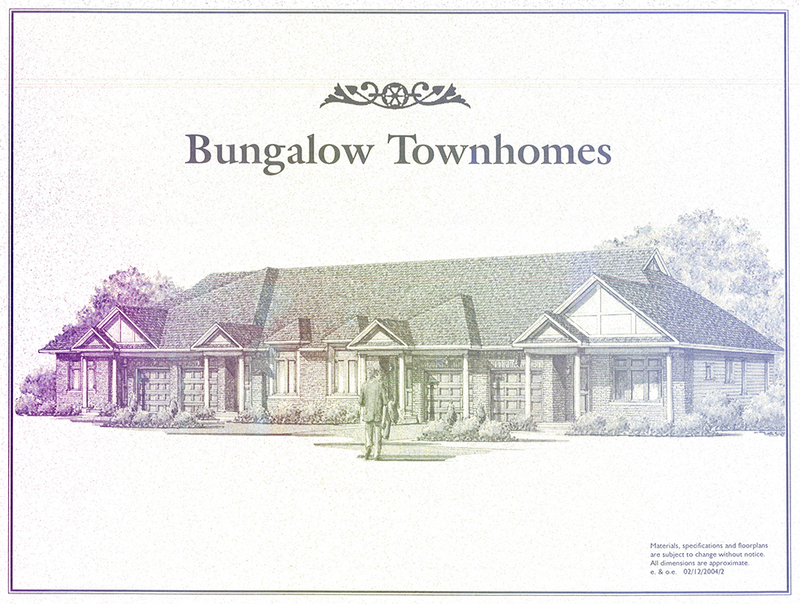 Bungalow townhome designs are an example of how the target market for bungalows has changed over time. In the mid 20th century, bungalows were one of the most popular home types and were mostly built in burgeoning suburban areas specifically for families. At the end of the century and into contemporary times, homeowners without children were looking to downsize — and thus, the bungalow townhome was created. Bungalow townhomes have become appealing to mature buyers for their smaller, low maintenance yards, and smaller price point — downsizers can enjoy moving to a new home without a heavy financial lift. 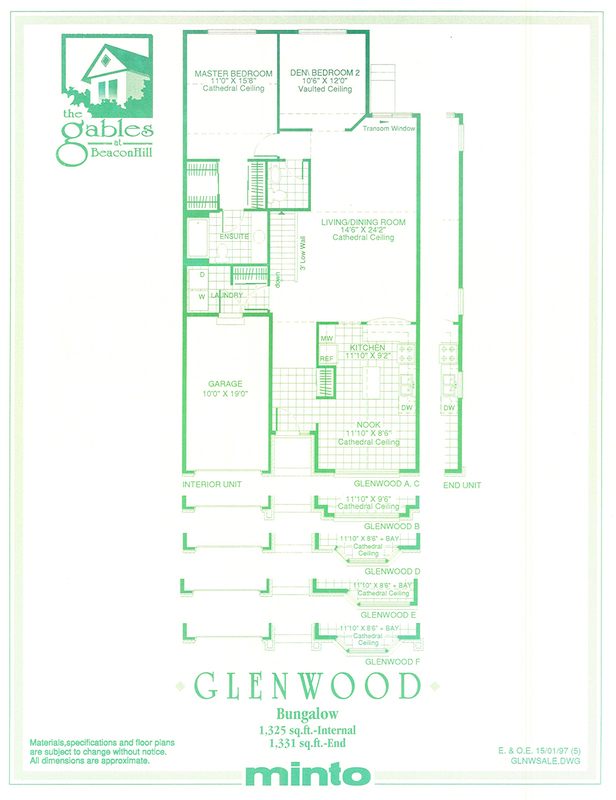 Some of Minto’s earliest bungalow townhomes can be found in Tanglewood as garden home designs without garages. Built in the 1970s, these high ranch designs are products of their time and built for families with four bedrooms, two on the main level and two in the basement. This is one of the only times Minto built bungalow townhomes during the decade, although some semi-detached designs did appear in limited numbers. 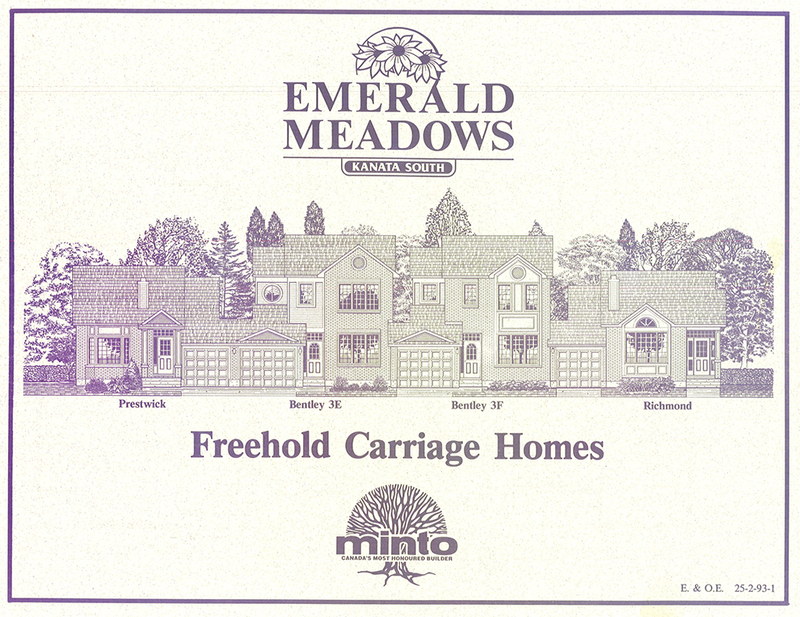 During the 1990s, Minto’s Carriage Homes (homes only attached by the garage), had two bungalow designs. The layouts could work for small families but also empty nesters. The designs have two bedrooms on the main floor, with the unique layout of a shared bathroom between them, plus a powder room for guests. 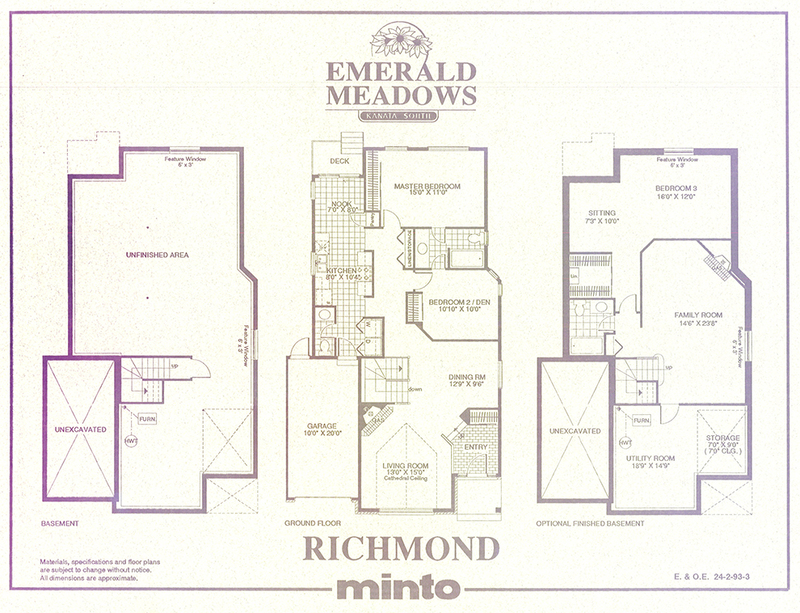 Subsequent Minto bungalow townhome designs all have an exclusive ensuite bathroom off the master bedroom. In more recent years, bungalow townhomes have been targeted towards empty nesters with fewer bedrooms, sometimes with only one plus a den on the main floor. Having a one-bedroom home would have been unheard of in earlier years. With these designs, most of the main floor space is dedicated to living areas, ideal for those downsizing from a larger house. With a lack of side windows in a townhome, cathedral ceilings add a sense of space to the interior. At the Gables in Beacon Hill, a condominium bungalow townhome complex built in the late 1990s, nearly all the main floor rooms are vaulted. The two plans that were built have only one bedroom, plus a main floor room that could either be a den or second bedroom. 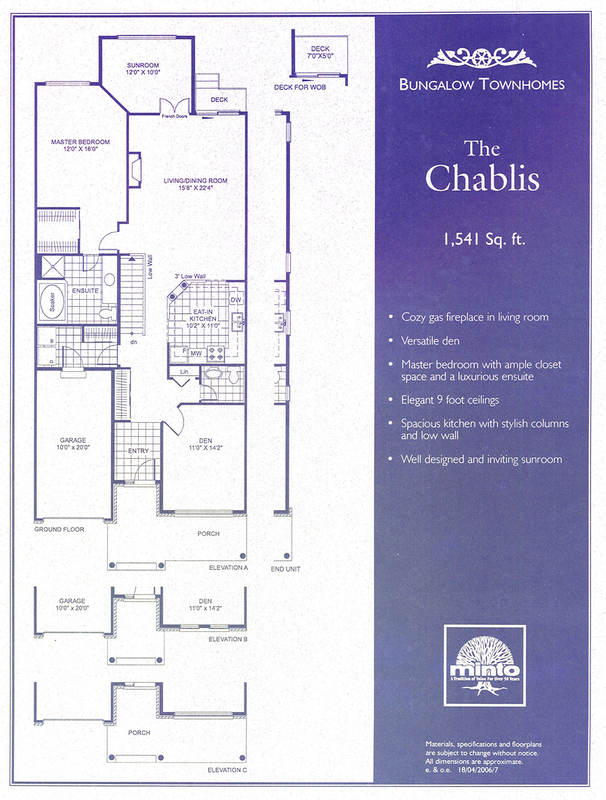 In the early 2000s, the Chablis introduced a sunroom at the back of the home, in addition to a den at the front. Off the only bedroom is a large ensuite bathroom—almost as large as the kitchen—and a walk-in closet. The arrangement of spaces in the home is clearly planned for a couple or someone without children at home. An aspect that sets Minto’s bungalow townhome designs apart from others in the city is that the garage is always recessed into the home, instead of protruding out front. This does necessitate that designs be wider than standard townhomes, but the garage allows for large front facing windows and a sense of curb appeal. In the past, bungalows and bungalow townhomes were predominantly designed for families, but by the 1990s they became popular options for downsizing buyers as well. As such, fewer bedrooms and larger living spaces have become the norm in these types of homes.